For pictures and drawings of other ways to mount UniPunch tooling visit the Mounting Methods page. You can use your press brake for punching a prototype run of parts. 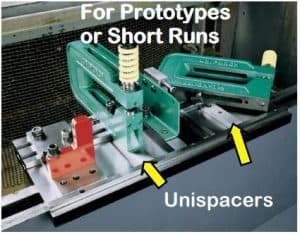 Consider using the UniPunch unispacer method for punching prototypes. Unispacers snap into in a bed rail, and if the hole spacing changes, you can simply reposition the unispacers to accommodate the new hole pattern. For staggered hole patterns, use the slotted side (not illustrated) of the unispacer. 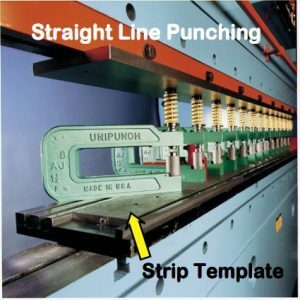 Here is more information on other UniPunch mounting options.